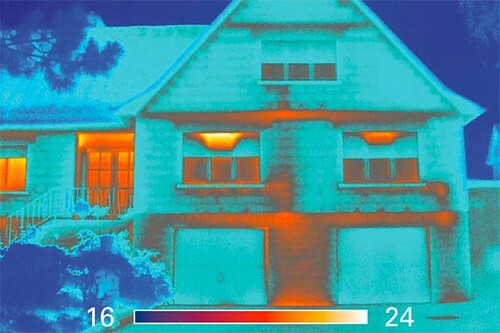 Thermal imaging can be used to document heat/AC leaks from insulation gaps on a building's facade, reveal warmer ground water inflows (either fresh or chemical-laden) or "thermal pollution" from industrial processes entering ocean-temperature waterbodies, as well as identify areas on the human body experiencing infection or stress (includes epidemiological applications). Specific models of FLIR brand cameras, known as the FLIR GasFinder (http://www.flir.com/ogi/display/?id=55671). See GasFinder below for more. Community applications so far include both a "heat-busters" program in East Harlem and a "forensic" water quality monitoring program in the Gowanus Canal. A Thermal Flashlight: a RGB LED flashlight with a non-contact infrared sensor that "paints" the temperature of the surface directly on the wall for capture with a second timelapse camera. A Thermal Fishing Bob: dragging a thermometer through the water, taking contact measurements mapped to a RGB light, also for capture with a second timelapse camera. A scanning thermal camera on a LEGO turntable (software also in development) that sweeps back and forth across a scene, recording the temperature variation to build up an image. Why make a DIY version? "FLIR" cameras can produce images such as the one below, and are typically used to identify heat leaks, but even low-resolution FLIR cameras can cost thousands of dollars. The goal of these DIY thermal camera projects is to make this kind of investigation (and the potential savings) cheap, easy, fun, and informative for those of us without $10k in our pockets.